The Industrial Workers of the World (I.W.W.) was a radical organization in the United States that was most active between the turn of the century and the 1930s. The Wobblies, as they were known, believed there must be radical changes in American capitalism to improve the oppressive conditions that workers faced. Many I.W.W. members believed in socialist or communist ideology and some advocated whatever means necessary to effect change, including sabotage and violence. The Seattle chapter of the I.W.W. was founded in 1905 and contributed to the city's reputation as a hotbed of labor radicalism. The local office showed a keen interest in labor-related and Wobbly-related activities across the nation, but most of its activities focused on organizing labor within the state. Beginning in 1907, the Seattle I.W.W. 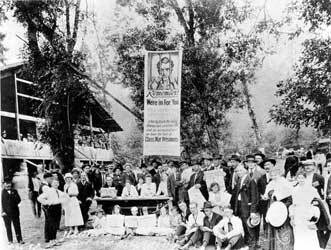 undertook a campaign to organize Washington's lumber workers. Wobblies believed that the poor treatment and low wages in the industry would make lumberjacks and mill workers receptive to leftist ideas. However, the employers in mill towns and lumber camps fought these attempts vigorously by screening out Wobbly workers and sympathizers, using detectives and by directing vigilante groups. For the most part, the timber companies' efforts to drive out the Wobblies in the early 1910s were successful, but World War I and the accompanying economic boom in the lumber industry strengthened the hand of the unions. Everett had been one of the few mill towns where labor radicalism remained strong in spite of the business community's concerned efforts to drive it out. Wobblies in Everett, joined by members of the Seattle I.W.W., continued to deliver radical rhetoric despite vigilante beatings and arrests. After the brutal beating of forty Wobblies whom deputies had taken out of jail and turned over to a group of vigilantes, the Seattle I.W.W. rallied 250 supporters to sail to Everett on November 5, 1916. Upon their arrival the men from Seattle faced a force of almost 200 newly-deputized citizens. After a heated confrontation involving gunfire, five Wobblies and two deputies were killed, over thirty men were wounded, and an unknown number of Wobbly sympathizers fell overboard to their deaths before the boat cast loose and returned to Seattle. Although most of the Seattle community and its mayor condemned the Everett Massacre, the Wobblies who returned to Seattle were arrested and faced murder indictments. However, none of these men were convicted and the Tragedy became a rallying symbol for the I.W.W. and brought the organization sympathy from many outsiders. 1919 was one of the most eventful and promising years for the local I.W.W. because of the Seattle General Strike. Sixty-five thousand of the city's workers, from hotel maids to garbage collectors, announced they would not work until the federal government and local shipyard owners granted wage increases to workers in the city's shipyards which had boomed during the war. This walkout virtually shut down Seattle from February 4th to February 9th. Although the more conservative American Federation of Labor was mainly responsible for the strike, the Seattle I.W.W. nonetheless participated and saw the strike as an harbinger of more worker solidarity and radicalism to come. Instead of fulfilling radical dreams, the decade following the Seattle General Strike proved disastrous for the I.W.W. With the war ended, the federal government shut down its shipyards, taking away much of the strength of Seattle's economy which in turn made it more difficult to organize labor. The conservatism and anti-communism of the 1920s proved to be even more harmful to the I.W.W., as the events of Centralia in 1919 would show. On November 11th several American Legionnaires planned to destroy the local I.W.W. office at the end of the Armistice Day parade. Alert to the Legionnaires' plans, the Wobblies armed themselves to protect their headquarters. After a bloody gunfight, the Legionnaires took over the I.W.W. meeting hall and captured the fleeing Wobblies. That evening, one of the captive Wobblies was removed from jail and lynched. Unlike the public sympathy that followed the Everett Tragedy, the Wobblies received little public support despite the murder or the destruction of the meeting hall. The repression of the I.W.W. in the 1920s wasn't only from vigilantes. In 1920 the Washington State Supreme Court upheld the state's criminal-syndicalism law which made it illegal to advocate crime, sabotage, and violence as a means of accomplishing political or industrial reform. Criminal syndicalism laws made it much easier to prosecute Wobblies and forced them to conduct many of their activities underground. I.W.W. members in Washington and many other states faced prosecution for various offenses and often lost their cases despite the fact that the American Civil Liberties Union often lent them legal support. During the Red Scare of the 1920s, federal and local authorities were able to raid the Seattle I.W.W. office with impunity destroying many of their records and files. The Great Depression of the 1930s improved the fortune of the IWW somewhat, but the organization was not as strong as it had been earlier in the century. A major campaign that the I.W.W. undertook in Washington was the organization of agricultural workers in the Yakima Valley. However, local farmers managed to counter agitators' efforts through vigilante efforts and through the cooperation of the local prosecuting attorney. Seattle attorney, Mark Litchman managed to defend the agitators successfully by bargaining. World War II, and especially the anti-communism of the postwar era, made it particularly difficult for the I.W.W. to function effectively. The Seattle I.W.W. office closed in 1965.